"Once, you were the predator. When magic returned to the world, it transformed humans into elves, dwarfs, orks and trolls - and ordinary animals into fantastic creatures out of legends and nightmares. New creatures arose overnight, all of them unique and potentially deadly. Shadowrunners may go up against saber-toothed cats, sea monsters, giant lizards that turn the unwary to stone, or even more dangerous animals. From the sewers of the urban jungle to the wilds of Africa and Amazonia to a zoo full of critters gone made, it's time to find out who'll survive: man or beast! Predator and Prey is a collection of three Shadowrun adventures that pit metahumanity against powerful and dangerous Awakened creatures. For the first time, shadowrunners are plucked from familiar surroundings and placed in environments that favour their paranormal antagonists. Player characters must survive everything from giant reptiles in the sewers of Seattle to an attack by swarms of bloodthirsty monkeys in the middle of the African jungle. 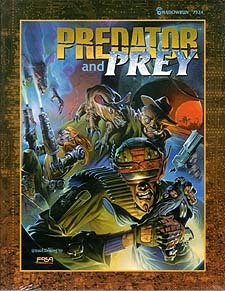 Predator and Prey contains all the information needed to play, including details about adventure locations, creature statistics and powers. Predator and Prey is intended for gamemasters and player of all experience levels.